It’s hard to sneak up on anyone with a full marimba band. 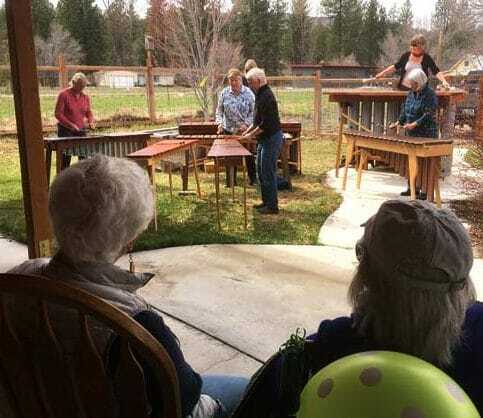 But that’s what local marimba teacher Barb Hoffman did for her mother, Maggie Hampton, on Maggie’s 90th birthday on April 18. Keeping optimistic eyes on the weather, Barb and her fellow musicians contrived to set up five soprano and tenor marimbas, one hefty baritone, and one even more substantial bass (not unlike the size of a Volkswagen Beetle) in the courtyard at Jamie’s Place. There they played lively tunes to honor Maggie’s birthday, so that Maggie, her three adult children, and many of her friends could observe the concert while still sheltered comfortably indoors. After a short but memorable performance, the musicians joined Maggie and her companions inside, where everyone enjoyed birthday cake. Maggie Hampton was serenaded by a marimba band for her 90th birthday. Last week I was dropping off my daughter at the elementary school and I realized that instead of letting her out in the drive-through drop zone, I needed to park for just a moment. There were no parking spaces immediately available and there was a car behind me, so I pulled into the non-parking space that I had always thought of as the walkway to the tennis courts. I wasn’t leaving my car and I was only going to be there 2-3 minutes, I reasoned with myself, so surely it would be fine. As soon as a car pulled into the handicapped parking space next to the walkway I was parked in, however, I realized it wasn’t fine. The space I occupied isn’t just a convenient way to access the tennis courts; it’s actually an integral element of the handicapped parking space adjacent to it. With my car in the way, the mom dropping off her son in his wheelchair didn’t have room to maneuver the chair. In a sweet and tactful voice, the mom said to me “You know, this isn’t actually a parking space.” She was right and I knew it, and I apologized. There was nothing confrontational about the interaction; the mom had pointed out my transgression in the nicest possible way. But then the mom did something that so many of us — especially women — tend to do; she apologized for being assertive. Admiring the brave flicker of strength it must have taken this mom to speak up about my insensitive and probably illegal parking job, I tried to get her to take back her apology. 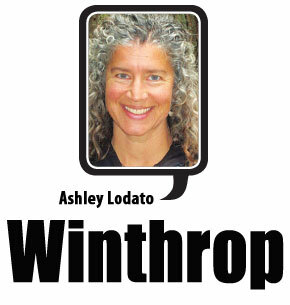 I was in the wrong; she had nothing to apologize for. And yet she felt compelled to do so, because being brave and speaking up isn’t something that girls learn to do, so we grow up into women who aren’t comfortable with it. We learn that being polite is better than being bold and spend our lives apologizing when we manage to summon the determination to stand up for ourselves or to take up space in the world. When I parked without much forethought last week, I was taking up space — but the wrong kind of space. If anything comes of this incident, I hope it’s a nudge to those who need it to take up a different kind of space — the kind of space that requires both tact and courage.